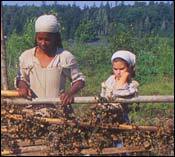 In this section you will find a variety of resources for bringing Colonial America to life in your classroom. "Pray, Why Speakest Thou in Such Addled Tones?" Note: These lesson plans may be utilized pre- or post-viewing of COLONIAL HOUSE, or in generalized units on the early colonization of America. While the lessons are targeted to students in the middle grades, feel free to adapt them to meet your students' needs and your curricular goals.